I’ve been heading off to Venice for around twenty years now, as a visitor to begin with, now mostly for work. Either research or ideas or to finish off a book in the quiet of the little apartment of Dorsoduro I’ve rented off and on for the best part of a decade. There’s nowhere else quite like it. But the changes in those twenty years are quite depressing. No wonder the locals feel cheated and neglected. To the casual visitor the place itself might seem much the same. But month by month the city is losing many of the vital social connections that make life there acceptable for the declining number of residents. It’s hard and expensive enough living in a city where everyday items must arrive by boat, be lugged through streets then carried up often narrow stairs. But along with the unavoidable has come the decimation of the city’s everyday shops. On the corner of Campo Santa Margherita where I stay there used to be a fantastic local butcher. It’s now the inevitable bar. All over the city essential shops — bakers, stationers, butchers even fishmongers — have given up the struggle to survive and closed. And in their place? Identikit bars selling identikit food and drink. And so many places flogging masks and glass — much of it fake Murano from China — you wonder what their margin must be to make a living. Most of Italy is still remarkable for supporting the individual shopkeeper over the supermarket. Even in the centre of Rome you can still find wonderful small wine shops and delicatessens. In Venice you’d struggle to manage without going to a supermarket. As one local put it to me recently… you can buy a mask or a piece of glass just feet from the front door. But if you want some kitchen roll you might have to walk a mile. Last time I was there I saw the latest victim. The Strada Nuova has never been the greatest of streets. It leads from the station to the Rialto, a succession of cheap cafes and restaurants, most of them best avoided, and so many tourist tat shops the mind boggles. But halfway along there was this lovely little place for anyone who owned a pet. In a city that loves its little dogs this was one of the best pet shops you could find. Friendly staff and, as you can see from the window display, with a great sense of humour too. And what is it now? A bar. What else? For all I know a very good bar. 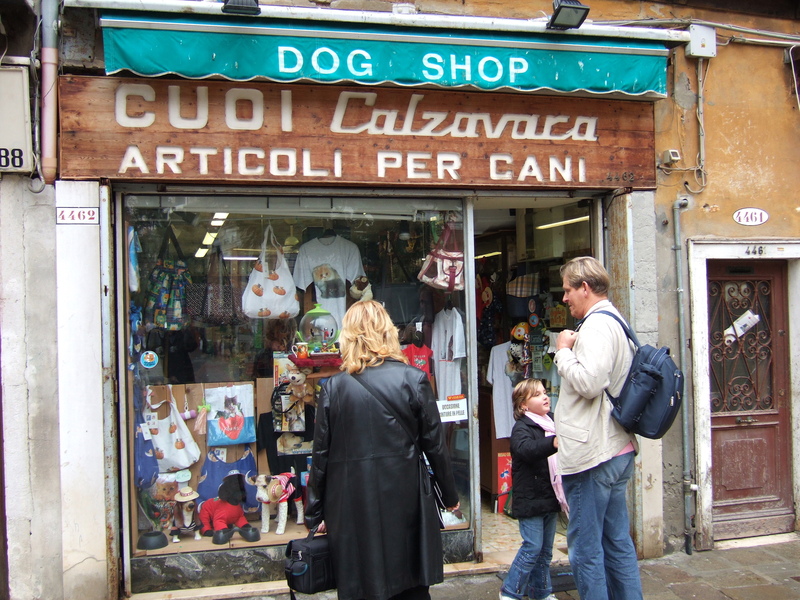 But really… the last thing any resident of Venice needs is another place where you can buy spritz and cicchetti. A decade ago I wrote of Venice turning into a kind of Disneyland with gondolas. A regular visitor berated me at the time. How could I even think such a thing? Today it’s almost a cliche. Without Venetians that’s just what Venice is: a soulless theme park. There’s a vicious circle here. As the resident population dwindles so the shops become uneconomic. And as the shops vanish it becomes harder and harder to stay. Every loss of a local business and its replacement by one more cafe, tourist tat shop or mask emporium is another nail in Venice’s coffin. Local politicians need to take their eyes off squeezing more and more tourists and giant cruise ships into the city and start focusing on keeping Venice alive before it’s too late.